The owner of the Greenvale Hotel in Cookstown, Michael McElhatton, has been arrested on suspicion of manslaughter, following the deaths of three teenagers outside a disco at the premises. The 52-year-old and a second man aged 40 are being questioned after Sunday's incident. Lauren Bullock, 17, Morgan Barnard, 17, and 16-year-old Connor Currie, died after a crush outside the hotel. Some 400 people were outside the venue during the crush, police have said. The funerals for the three teenagers will be held on Friday. On Wednesday, the Northern Ireland Affairs Committee at Westminster observed a minute's silence for those who lost their lives. Officers are examining CCTV footage of the incident and have appealed for any mobile phone footage or photographs of the crush to be passed to the investigators. They have asked people in possession of images not to publish them online but to upload them to the Major Incident Public Portal. The hotel was hosting a St Patrick's Day party on Sunday night and a large group of young people were queuing to get into the disco at about 21:30 GMT. The emergency services were called to the hotel after reports that several teenagers had been injured in the crush. The Northern Ireland Ambulance Service declared it a major incident and police, firefighters and environmental health staff rushed to the scene. Officers want to speak to people who were at the hotel at the time and have already tracked down 160 witnesses. They have reassured anyone who was in the queue that they will not face questions about being under-age at a licensed premises. After discussions with the director of the Public Prosecution Service, Det Ch Supt Raymond Murray said the PSNI have agreed that age is "not an issue in this investigation". Lauren Bullock was a pupil at St Patrick's College in Dungannon while Connor and Morgan attended St Patrick's Academy in the same town. Support has been offered to young people affected by the tragedy. Northern Ireland's Education Authority (EA) has deployed staff from its "critical incident team" in five local schools. EA chairwoman Sharon O'Connor said her organisation had also "provided support and advice to a further seven schools in the area". "The EA Youth Service has opened its facilities at Ógras Youth Club, Coalisland, Dungannon Youth Resource Centre and Cookstown Youth Resource Centre in order for young people affected by the tragedy to engage with youth workers," she added. Books of Condolence were opened on Tuesday morning at The Burnavon Arts Centre in Cookstown, Ranfurly House in Dungannon, and at The Bridewell Centre in Magherafelt. The leader of the DUP Arlene Foster signed the Book of Condolence in Cookstown on Wednesday. She said as a mother of two teenagers she could not begin to comprehend the "pain and anguish" the families are going through. The funeral for Morgan Barnard will take place at St Patrick's Church, Dungannon, at 10:00 GMT on Friday. 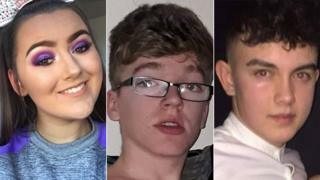 Separately, the funeral for Lauren Bullock will be held at St Patrick's Church in Donaghmore at 11:00 GMT, with the funeral for Connor Currie taking place at St Malachy's Church, Edendork, at 14:00 GMT.